After several days of torrential rainfall, we braved the elements to visit Kakabeka Falls (aka Niagara of the North) with our friends from Thunder Bay. It was a late start for everyone today after the concert last night and Karen's birthday celebrations. When we were all finally up and about, we pitched in to help Karen's dad put up a gazebo in the yard. In comparison to the last few days, it was actually a balmy day and the thought of sitting outside relaxing in the garden ... in the warmth was appealing - it was finally starting to feel like summer. After a hearty breakfast of bacon and eggs cooked up by Guy, we formulated a plan of sorts to take a drive out to the Kakabeka Falls then head out for dinner. 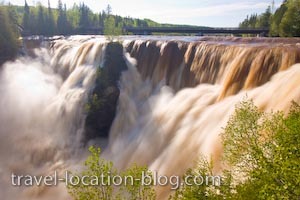 We packed up the car and drove for around 10-15 minutes out to Kakabeka Falls Provincial Park to take in the sights of the Kaministiquia River in flood. Kakabeka Falls, which are positioned along the Kaministiquia River and are also known as the "Niagara of the North", plunge 40 metres over a rugged escarpment and are the site of some of the oldest fossils on the planet. After the torrential rain in the past week the river had more than doubled in size and volume. The falls were definitely an impressive sight with the murky waters hurtling over the crest of the cliff sending mist high into the sky. Luckily the viewing platform near the carpark was not in the path of the cool, saturating spray, so we spent some time there photographing. A bridge took us across the river above Kakabeka Falls and afforded stunning views of the flooded river gorge. Colourful rainbows were suspended above the crest - caught in the mist as they faded in and out of sight with the changing light. On the opposite side of the river is another boardwalk, viewing platform, and information centre. Part of the boardwalk was impassable due to the flood waters lapping at the edges of it. The viewing platform offered a great view of the swollen waterfall if you didn't mind a shower at the same time! The rainbows were stunning as they arched between the walls of the gorge over the river - appearing in doubles. We walked back across the bridge (for more photos) and then back to the car - it was dinner time and we were hungry again. Our dinner destination was the Masala Grille - situated at 170 N. Algoma Street in downtown Thunder Bay. Masala Grille serves Indian and Thai Cuisine for lunch and dinner, 7 days a week. The restaurant has the only authentic traditional tandoor oven between Toronto, Ontario and Winnipeg, Manitoba and the meals are exceptionally good. We spent several hours chatting once we met a couple of Guy's friends, and feasted on the fine food before closing time. We headed back to the house, and although our intentions were to head to bed, we ended up chatting until around 5am - the sun was just about to make an appearance for the day as we were crawling into bed but we did manage a few hours of sleep.